The Phoenicia Lodge is vintage Catskills lodging. Loaded with character and charm, our clean and cozy motel rooms, cottages and spacious suites are situated in a semi-wooded valley between Route 28 and the Esopus Creek, surrounded by gorgeous mountains and just minutes from Main Street Phoenicia. The Catskill Seasons Inn is a year round destination and is one of the larger accommodations in the Belleayre region, replete with in ground seasonal swimming pool, tennis court, minutes to ski areas, hiking trails and much more. Inspired by the heritage of the Catskills and a regimented happy hour, The Graham and Co. is a modern take on the classic weekend away. amenities, including heated salt water pool. with harvest from kitchen garden. Full bar & wine cellar. Relaxing environment of your own cabin! Luxury in the outdoors. Suites and rooms available- perfect for couples and families. Restaurant next-door and 15 minutes to Belleayre. Visit our World’s Largest Kaleidoscope and come visit our shops and coffee shop. Beautifully restored, the picturesque Phoenicia Belle B & B is located in the heart of the charming village of Phoenicia. Walk to great shops, restaurants & NYC bus stop. Just 15 minutes to ski slopes. Great ski packages for Belleayre. The Woodland Valley Lodge is a historic, waterfront 1910 craftsman fishing lodge on the Woodland Valley Creek. Newly updated to bring you the charm of a 100 year old lodge that sleeps 10 + all modern conveniences. The naturalist John Burroughs described Woodland Valley perfectly when he said, “Of all the retreats I have found amid the Catskills, there is no other that possesses quite so many charms for me as this valley…” We agree with Burroughs – this valley is indeed the best of the Catskills, and the Woodland Valley Lodge is the best of the Valley. 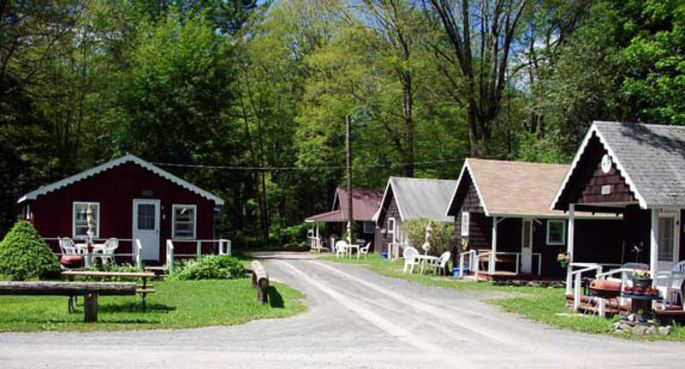 Phoenicia Black Bear Campground is a beautiful camp located directly on the Esopus Creek in Phoenicia New York, in the heart of the Catskill Mountains and close to Hunter Mountain, Woodstock, Bellayre Mountain. We offer group and individual camping sites along with RV sites. We are animal friendly. We are located in the heart of the Catskills, right on the banks of the Esopus Creek, just 20 minutes off the NYS Thruway in Phoenicia, NY.